So, how about those polls, anyway? On the Democratic side, they couldn't have been more wrong; after confidently predicting a double-digit Hillary Clinton win in Michigan, the former secretary of state ended up humiliated by Bernie Sanders, who bested her statewide, 49.8 percent to 48.2 percent. Clinton picked up the Metro Detroit counties of Wayne, Oakland and Macomb, as well as Genesee and Saginaw, with scattered others around the state. But Sanders beat her everywhere else, and, in the end, her success in the more heavily populated southeast wasn't enough to save her. On the GOP side, conservative west Michigan went for conservative Ted Cruz, but again, it wasn't nearly enough to stop Donald Trump's juggernaut, which had crushing vote margins in places like Macomb and Oakland counties and most others, too. 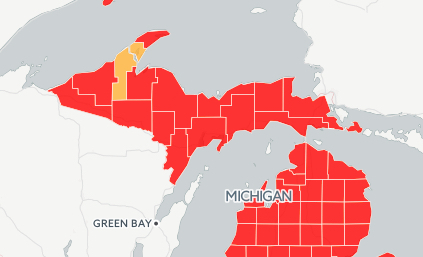 Trump (36.5 percent overall) got over 50 percent of the vote in seven counties, mostly in the northern lower peninsula. The only other Republican to be a factor was Ohio Gov. John Kasich (24.2 percent), who took Washtenaw and Kalamazoo counties and finished third behind Cruz (24.9 percent) statewide. Donald Trump saw his pre-election poll numbers turn into reality, racking up wins across the state and doing his best in Macomb and St. Clair counties, while Sen. Ted Cruz did well in West Michigan, denying Ohio Gov. John Kasich a second-place finish. Sen. Marco Rubio finished a distant fourth. Sen. Bernie Sanders scored a huge upset in Michigan, winning across the state and overcoming former Secretary of State Hillary Clinton's expected victories in Metro Detroit. Advance polling had shown Sanders losing by as many as 20 percentage points. "Trump rolls across Michigan"??? What have you been smoking at the Bridge office? Trump wins Michigan by a few percentage points more than 1/3. Kasich comes on strong and gets 2/3 of what Trump does and almost ties Cruz. Based upon primaries so far Trump has the most votes but certainly not an overwhelming lead and definitely not a mandate. If the results in Michigan mirror the eventual results at convention time All Cruz has to do is promise Kasich VP and Kasich pledges his votes to Cruz while Cruz picks up another 4% from Rubio and undecideds. And Trump loses. A very possible scenario. And one I hope will happen. Yes-I'd bet that Trump will top out at 35% average nationally-just counting Republicans. He's a better negotiator than Cruz, who has trouble getting support from those who know and have worked with him. Cruz is scarier than Trump, to many people, and will have a difficult time in a general election with Independents. You are so right. The "anybody but Trump" vote is huge, as someone would say. To say that Trump won overwhelmingly is simply not true. He got more votes than any of the other candidates but sill less than all of the others put together. The pollsters are eating crow - apparently turnout was higher than they expected, which meant they miscalculated "likely voters" (I'm guessing especially among the under-thirty crowd). This may indeed have implications for Ohio and maybe even Ill. Although I've been supporting Sanders, I'm still not betting on his taking a majority of earned delegates, but I definitely hope he will keep nipping at her heels all the way to California. Although she has inched a bit more to the left, she still has quite a ways to go to convince middle and working-class voters that she would really fight for major reforms. Her Wall street ties are only part of the problem. IMHO, the problems we've been facing in the US in the recovery from the Great Recession are due primarily to the failure to make more use of fiscal stimulus, which really could have done much more. Unfortunately, the GoP dug in their heels against a bigger stimulus package on the grounds that, in previous recessions, such stimulus came on stream "too late to make much of a difference." They therefore insisted they would only fund "shovel ready" infrastructure projects, never mind the fact that they had been slashing funding for infrastructure (including preparatory works) for at least a decade. So now we have both crumbling infrastructure (which increases costs for everyone - both physical wear and tear on vehicles and delays in traffic jams, not to mention higher risks of severe accidents) and a still-anemic recovery. As for the growing inequality, that dates from at least 1980 if not before. I agree with Dean Baker of the CEPR that the failures to enforce anti-trust policy, along with rent-seeking triumphs like ever-expanding intellectual property rights (e.g., longer copyright durations, new protections for "biologics", all the expansive protections won by Monsanto for GMO seeds, the ability to assign trade-marks to tax havens, etc. etc. etc.) have had a substantial impact on inequality and it keeps getting worse. The SCOTUS enables big business to deny workers and consumers the opportunity to use the courts for redress through class-action suits and forces us into binding arbitration, which is rigged in favor of all the corporate lawyers. They also ruled in favor of expansion of "eminent domain" to screw home-owners at the expense of real estate developers in cahoots with corrupt local politicians. Not to mention Citizens United, followed by the GoP successfully demonizing the IRS when they tried to curb the abuses of dark money going into "social welfare organizations" but used for partisan poliltics for yet more rent-seeking. The new trade deals just expand all these perks for capital, at the expense of labor. I used to go along with the notion that the gains of trade could be shared so that taxes on the winners would pay for generous worker retraining and re-location for the "losers" but of course tax and spending cuts came on stream just in the nick of time to make sure THAT wouldn't happen either. All this on top of stagnant minimum wages and ever increasing costs of both education and housing (with the ACA just barely being able to bend the health-care cost increases). My former colleagues in the World Bank have been extremely active in the area of international tax reform to improve cooperation between tax authorities in all the OECD countries (and more and more emerging countries) to close off opportunities for abuse of "transfer pricing" within multinational corporations, taking advantage of this country's loophole here and that country's loophole there to guarantee themselves near-zero effective tax rates on their global income. But of course, the corporate tax lawyers are always 10 steps ahead of the tax officials. As Robert Reich has said several times, Hillary is the best-qualified candidate for president within the current "system", but I am nowhere near convinced - yet - she would make any real effort to transform the system. Maybe after a few more primary scares she will think harder about what needs to be done, and convince us she is ready to fight the reforms we need, but more likely (no matter who becomes POTUS) we will have to keep up the "political revolution" by engaging more vigorously in the Congressional mid-terms and state and local elections. It will take time and perseverance but it is indeed possible. Amen! See yesterday's Reuters report on EU ministers agreement to share tax data on multinationals. Hillary's got to get her game on here if she hopes to win in November, given the collective sentiment against business as usual. When someone who leaves 4 Americans to die a horrific horrible death and then lies about it is the "best qualified candidate for president", this country is in a very very bad state. I certainly hope Ms Coolidge's remarks are not her desire to see a woman president regardless of character. I'm getting so sick of people going nuts over the attack on the embassy at Benghazi. Yes, it was a shame that American's were killed in that attack but I wonder why no one went nuts over any of the more than 13 attacks on American embassies that resulted in at least 60 deaths during George Bush's term in office. What would have been discovered about those attacks IF the Republican's had cared to investigate them? Just a thought. Hillary is the most phony candidate, that I have seen in my 56 years. Robin, Hillary is the one claiming the deep reservoir of experience, "the one who answers the phone at 3AM", and what happened when the call came? Benghazi has put that question to rest. But while you're at it what other great achievements can you point to? China, What's going on in the S China sea? Russia, Crimea? Middle east? North Africa? I thought we were going to see a great re-set. I see a record of failure. Although I plan to retire to the social democratic country of Spain in the near future, I only hope Bernie can win the presidency, house and senate with the help of independents that realize that Trump and Hillary have no idea what families are going through. Anyone that has left the island of America and ventured to either Canada or Western Europe know that for the majority of Americans, social democracies are the best places to live and work. Thank you for a very well thought out and informative comment! C'mon Bridge - an article that only addresses the geographical element of how the winning candidates put together their victories - nothing interesting about race, gender, age, voter appeals based on policy positions, income? No correlation between these factors and the geographical distribution of the votes? The Free Press comes out with an editorial about "What we learned" from this primary, and they basically identify nothing, just spitting out the numbers that we can all read, then you come in here and talk about how the votes were split geographically. The only good analysis OF OUR STATE'S PRIMARY that I've seen so far has come from The Economist (a British publication) who identified the anti-free-trade positions of the two candidates as a common element that likely attracted many Michigan voters. Why can't our local news sources provide some thoughtful insight instead of just reading us the numbers? There is so much that is interesting going on here, it would seem that we should be able to get something better. James Blanchard once said, more or less, voter turnout is everything. He was ahead in the polls many, many years ago in a race for governor. He warned his supporters that if they did not go to the polls on that rainy Election Day, he would lose. Voter turnout was low; he lost. The populist message of Trump and Sanders rang true across Michigan in this primary. It will be interesting to follow Sanders and see if there is any bleed over impact from his victory in MI to next week's primaries. The Clinton machine is probably read to do a full court press (after all it is March Madness time) to ensure that Sanders victory in MI does not carry any further. The Trump momentum can only be slowed by home state victories of two of the candidates. Rubio should throw in the towel before he is totally embarrassed.. According to your numbers in our Democrat state, the Republican voters out numbered the Democrat total vote 1,252,459 to 1,169,075. Hard to tell how that will fall out in the general, but it sure indicates a higher level of interest in this election on the Republican side. I agree! Your data is probably the canary in the mine. We have to hope more Dems come out for the national election (as they are wont to do) or face it that we really are, dispite Snyder's long list of unbelievable incompetence, abetted by one of the most disfunctional legislatures in modern Mi. history, become a totally Republican state. And how about accounting for Dems who voted in the Republican contest? I know of several who did. So, I doubt anyone can get any real indication of what the results mean in the minds of the electorate come November. Don't forget, it might have been the last time a voter had the chance to vote against a Clinton, and I know there were some Republicans, Independents, etc., who "got the burn" and crossed over to vote with the Democrats. They told me they learned that during the years the Democrats used the caucus and chose to vote in order to select the weaker of the candidates on the Republican side. It was estimated that 3% of Republicans crossed over to vote Dem. and 7% of Dems crossed over o vote Republican. That's a total of 10%...roughly 240 voters...not statistically significant, IMHO. For over half a century I have been a strong feminist and I would have been delighter to support a feminist candidate for president. So why did I not vote for Ms. Clinton? Her warmongering is too much for my idea that diplomacy should be used much more than raw military power. Ms Clinton had supported the disastrous war in Iraq, and help "expand" the mission voted by the UN concerning Libya. To top it, she lavishes prize for Mr. Kissinger, whom many consider a war criminal. Somebody more famous said - and I am paraphrasing : "To repeat doing the same thing and expecting a different result is stupidity". We have been entering indiscriminately in wars to remove bad dictators (agree they are bad) to cause total destruction, mayhem and eventually the insurgence of more violent groups. We can even go back to Viet Nam (agent orange still causing birth defects, Napalm? destruction of a country) and meditate if we learned anything about this devastating war. Are Iraqis better off today? Is Libya a better country today? Are we again supporting militarily another bad dictator in Egypt? .... and the happy bombing goes on in Somalia, Yemen, Pakistan, etc.